We love women who start movements! Especially the type that seek to break down gender barriers and stereotypes. You may remember Isis Anchalee, the San Fran software engineer who started a trending hashtag #Ilooklikeanengineer after appearing in marketing material for her tech company and being accused of not “looking like a real engineer” by anonymous critics. Crazy thing guys, she actually IS an engineer, and set out to prove that A) stereotypes about certain male-dominated professions still exist, and B) that women shouldn’t be seen as some exception to the rule just because of history. Her hashtag was so powerful that it inspired a doctor from North Carolina to start a movement amongst her own STEM industry colleagues. 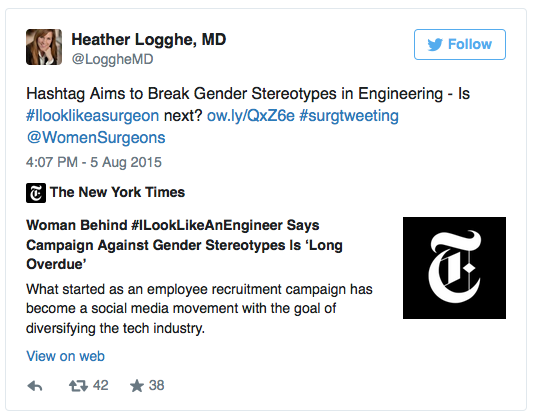 Dr. Heather Logghe from Chapel Hill saw Isis’ article and pondered to her twitter followers whether they should start a trending hashtag for female surgeons. The answer she received was an overwhelming “YES!” from women not just in her own community, but from female surgeons around the world who, like Heather, recognize there are still barriers that women face in terms of stereotyping in the medical profession. 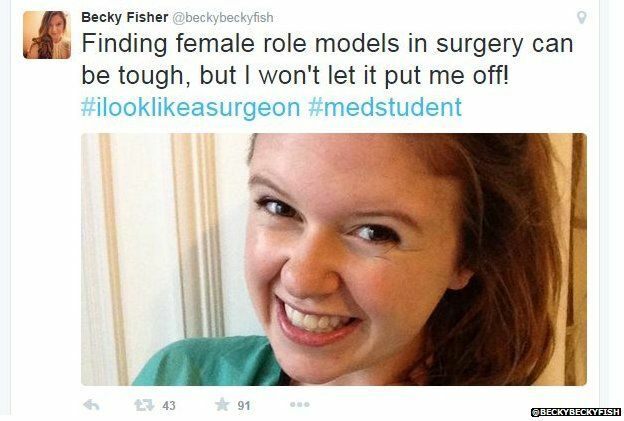 “It is hard to find role models that remind you of yourself as a woman in surgery. It’s been so traditionally male and unfortunately so many of the female role models have had to conform to the male stereotypes to survive,” Heather told Today in an interview. 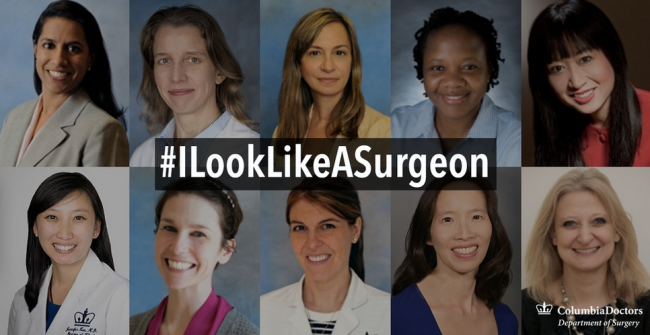 She tweeted a picture of herself and her adorable baby daughter with the hashtag #Ilooklikeasurgeon and before too long women around the world joined her in tweeting images of themselves in solidarity. 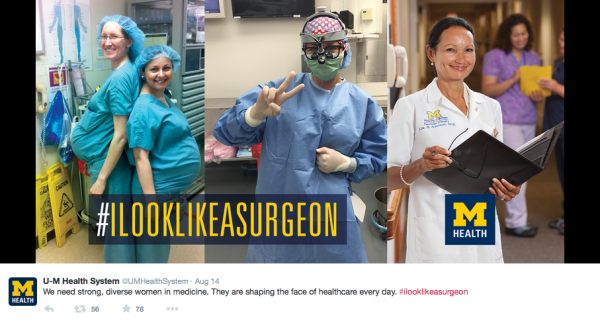 Boston.com reports to date there are over 11,000 tweets and close to 30 million impressions for the #Ilooklikeasurgeon hashtag! It’s not just women from around the world sharing their stories via tweets and images, medical practices and colleges such as University of Michigan Health System and Columbia Doctors Department of Surgery. Today shared stories from women who have overcome stereotypes and discrimination in their medical careers. Dr. Deanna Attai, 50, who is an assistant clinical professor of surgery at the David Geffen School of Medicine at UCLA and a breast surgeon said that when she was doing her residency, she was the only women throughout the entire 5 year period. Dr. Neeraja Nagarajan, an OB-GYN originally from India shared how she was warned having a medical would mean she wouldn’t be able to have a family, and others even told her being an OB-GYN was the only acceptable choice for female doctors in India. She is now doing a post-doctoral residency at Johns Hopkins University and was more than willing to lend her voice to this movement. Another doctor, Dr. Dana Khuthaila, a plastic surgeon in New York believes this hashtag is more than just a trending topic. “I think it is very important for people to think of surgeons as people and they are just as diverse as the community they are in. 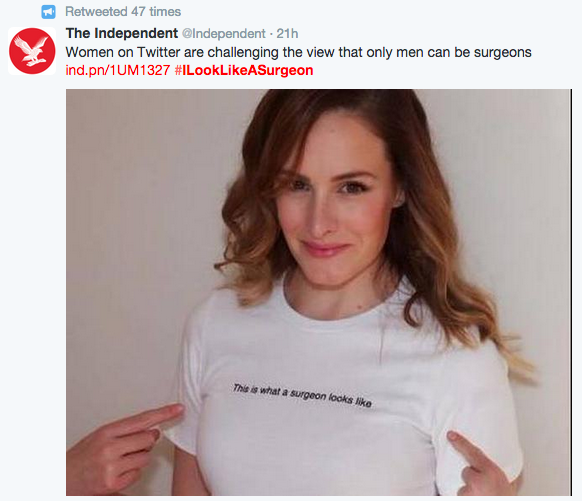 I think that people just think of surgeons as males and [it’s important to] show them what they are really like,” she told Today. 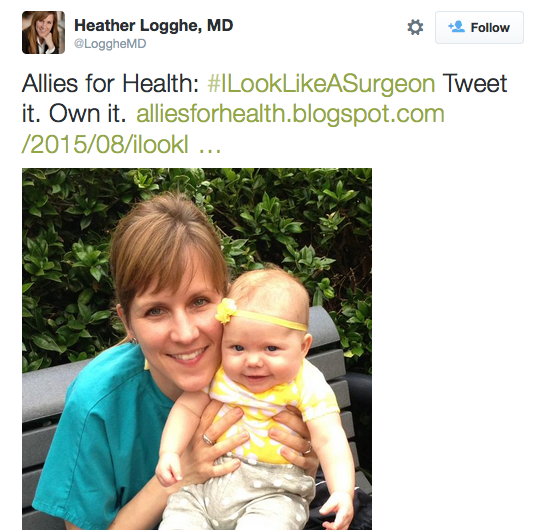 On Dr. Heather Logghe’s blog Allies For Health, where numerous other surgeons have shared their stories in detail, she has shared a number of posts about this hashtag and the ways it is continually being used around the world. She regularly updates it with images and reflects on a personal level what this movement has meant for her. “I’ve long felt surgeon culture needed some shaking up. May our new workplace culture recognize this: surgical practice was designed around men with few parenting obligations. That breed of surgeon is a rapidly-shrinking demographic. The growing demographic is female surgeons and new-age dads – people who parent,” she wrote. Research from 2014 from the US Census Bureau shows that women only make up 19% of all surgeons in the US today. The percentage of female physicians hovers around 30%, which is not bad, but it shows women are definitely underrepresented in these medical fields. What Dr. Heather started created was a way for the global female medical community to come together and know they aren’t alone, as well as give representation to the future female surgeons of the world. If the immediate image we conjure up of a doctor or a surgeon in our minds is a man with a stethoscope, or even McDreamy (yeah, we went there!) from ‘Grey’s Anatomy’, we still have a long way to go. We need determined women like Dr. Heather Logghe and the army of female physicians and surgeons around the world to stand up as role models where society fails. Here’s hoping the impact of this hashtag will be more than simply another twitter trend, but a turning point for the STEM community.